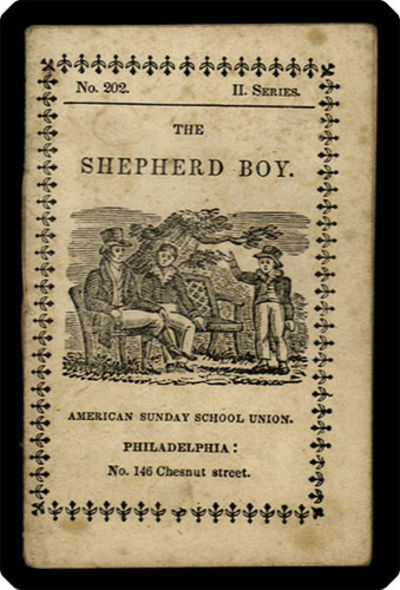 Philadelphia: American Sunday-School Union (stereotyped by L. Johnson), [ca. 1827]. Near miniature (8.8 cm, 3.5"). 15,  pp. ; illus. As one would expect of a publication of the American Sunday-School Union, what we have here is a good moral tale. It is illustrated with => 13 fine small wood engravings. The outside rear wrapper of this chapbook has — inexplicably — a cut of a tiger. The series information is at the top of the title-page: "No. 202. II. Series."